Strata Titles Act Amendment Bill 2018 Passed Parliament! home > Uncategorized > Strata Titles Act Amendment Bill 2018 Passed Parliament! The Strata Titles Act Reform team was today delighted to announce the Strata Titles Amendment Bill 2018 (STA Bill) passed Parliament (1st November 2018), ushering in the most significant changes to strata in over 20 years. During passage of the STA Bill, the Legislative Council referred Part 12 of the Bill (Termination of schemes) to the Standing Committee on Legislation. This review process involved an invitation for public submissions to the Standing Committee. The Standing Committee’s report was delivered on 16 October 2018, noting general support for Part 12 and made 10 recommendations to improve the safeguards. The government agreed with all 10 recommendations. Amendments to the STA Bill in response to those recommendations were passed by the Legislative Council and agreed to by the Legislative Assembly. The proposed reforms aim to make strata better and provide more flexible and sustainable housing options to benefit strata owners, residents, tenants, investors and developers. They aim to improve the way strata schemes work but not to change current strata owners’ land titles and boundaries. All strata properties registered as Strata Titles at Landgate are subject to the Strata Titles Act 1985 (the Act) and will all be subject to changes brought about by the Strata Titles Amendment Bill that is proceeding through Parliament. 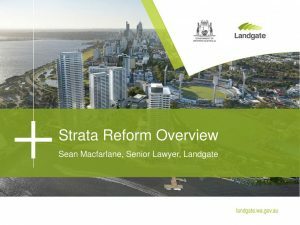 Watch the presentation below for an overview of the proposed strata reforms.